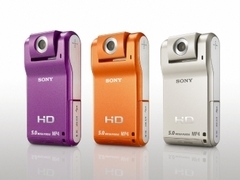 Sony are getting pocket camcorder-friendly, with the launch of their new Webbie range. Both models record in MPEG4 format, making uploading to the likes of YouTube a piece of cake, and they both record in HD. The MHS-CM1 looks more like your traditional camcorder, and features 5x optical zoom, a 5 megapixel stills camera ad a 2.5-inch LCD screen. The MHS-PM1 (pictured) has a lens that swivels 270 degrees, 5 megapixel stills capture, and a Memory Stick slot. Both models are available in the bizarre colour choices of orange, purple and (thank god) silver. Clearly that’s what those crazy kids are demanding nowadays. It’s not a massive surprise that Sony are having a stab at this market, although they are one of the first big manufacturers to do so. Will they beat Creative or the Flip? Time, and the kids, will tell.